NATO War Games In Poland Get Russia's Attention : Parallels Some 30,000 troops from 20-plus nations took part in Europe's biggest military exercise since the Soviet Union collapsed. It was meant to send a message to Russia, but critics warn it could backfire. Polish soldiers perform a medical evacuation as part of the Anakonda exercise in Poland. 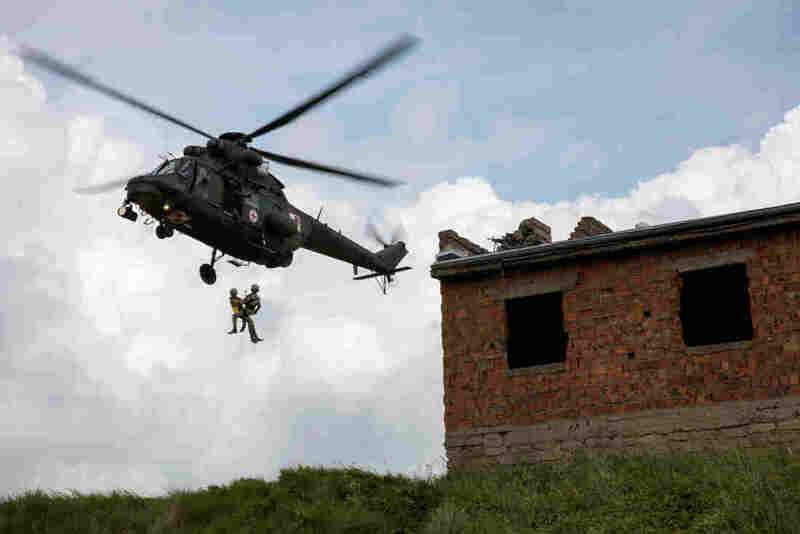 More than two dozen countries, including NATO members and partner countries, took part in the largest such exercise since the collapse of the Soviet Union in 1991. Europe's largest joint military exercise since the end of the Cold War rumbled to a close on Friday in Poland. More than 30,000 troops from across the North Atlantic Treaty Organization were there to send a message to Russia. "What we want to do is let the Russians know, and make no mistake about it — you step, even with your big toe, even with your unconventional 'little green men,' into one of our allied countries? To include the Baltic States? We will respond," said Evelyn Farkas of the Atlantic Council, formerly a top Defense Department official who focused on Russia and Ukraine. That's why European and American soldiers trained along with their Polish and other counterparts as part of the Anakonda 2016 exercise. They created scenes that would once have been unthinkable, including American and vintage Soviet-built helicopters (still in use in parts of Eastern Europe) practicing attacks together. Many American units participated, including the 173rd Airborne Brigade, National Guard soldiers from Ohio and Missouri and others. Non-NATO partners including Sweden and Finland also took part. Much of Poland's military arsenal is left over from the era when it was part of the Soviet sphere, and part of the goal was to train Polish and other Eastern European forces, now allied with the West, to work together with the U.S. and Western European-equipped troops. "Our No. 1 training objective is inter-operability with these countries," said Col. Phil Brooks, commander of the 1st Brigade of the 3rd Infantry Division. As he stood out in a field watching Polish attack helicopters take instructions from American tactical air controllers, Brooks said the soldiers were not running a scenario that targeted any particular hostile force. "No, nobody named," he said. Elsewhere on the training ground, Poland's field artillery commander simply laughed when he was asked, "Who is the enemy?" But the commander of U.S. Army Europe, Gen. Ben Hodges, made clear that NATO, and in particular its countries in the east, remains worried about Russia's 2014 invasion of Ukraine and wants to stop anything like it from happening again. "Everybody that lives close to them absolutely believes that this is a real possibility," Hodges told NPR. "We have to do everything we can to show that we are prepared. That is what deterrence is all about." 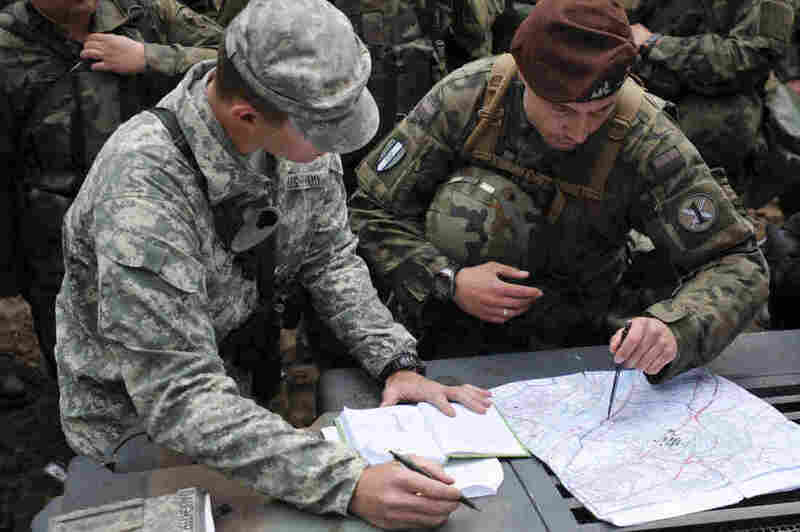 But NATO's Exercise Anakonda was not a show of force, Hodges emphasized. All the troops on hand from more than 20 countries would not be enough to pose a serious roadblock to a determined adversary. "At the maximum, we had about 31,000 soldiers," Hodges said. "That's like one-third of a football stadium where the Euro Cup is being played. So we don't have enough soldiers to even fill up one-third of a stadium." But John Mearsheimer, a University of Chicago political scientist who specializes in European security issues, said the war games amount to a dangerous "poke at the Russian bear." "Running large-scale military war games in Poland that are going to be seen by the Russians as a threat — and if anything, give them an incentive to go into the Baltic States — is, I think, remarkably foolish," he said. The Poles, for their part, seemed exhilarated by the Anakonda exercise. Defense Minister Antoni Maciarewicz said he sees Russia as a threat, but one that now worries him less. "We are now ready for any bad eventualities," he said during the final day of war games. "We are prepared for the worst — but this worst thing will not happen because the American presence here in Poland will serve as a deterrent." Roughly 60,000 American troops are posted around Europe today, well below the Cold War peak of about 500,000. The Pentagon is planning to rotate more Army units through European deployments, including a new brigade next year, and will more than quadruple the planned spending of $3.4 billion on what it calls European "reassurance." 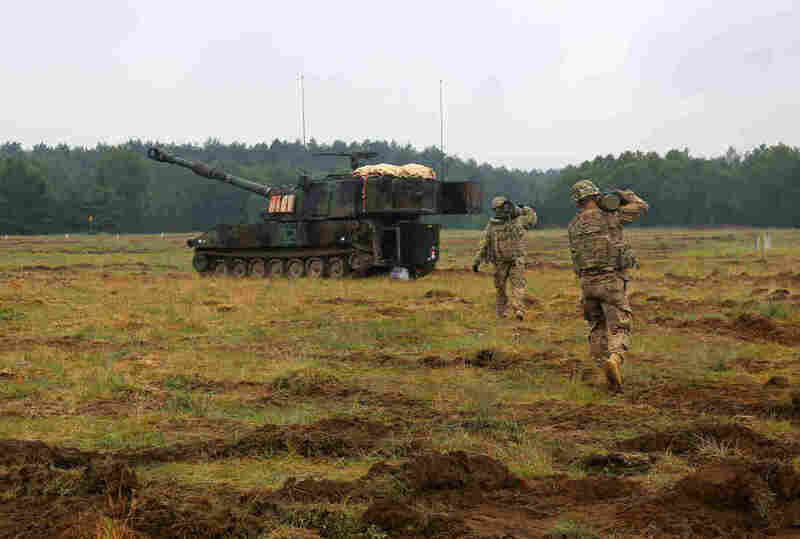 U.S. soldiers carry a 155 mm artillery round for a live-fire training exercise during the Anakonda war games near Olezno, Poland, on June 14. History, Hodges told NPR, shows that Russians only respect strength, and that they will push forward against any sign of weakness. "The United States is going to spend a lot of money to bring equipment back over to Europe that we used to have lots of," he said. "Decisions were made three or four years ago that probably made sense at the time, but Russia has reminded us who they are." The radio version of this story mistakenly states that Col. Phil Brooks "commands the Army's 1st Brigade 3rd Infantry Division out of Fort Benning, Ga." Brooks is based at Fort Stewart, Ga.